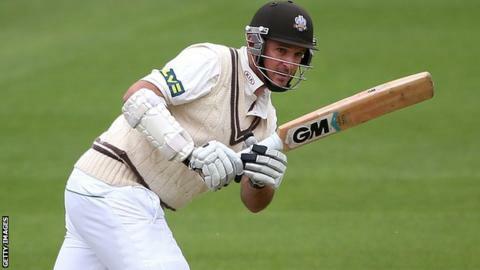 Surrey skipper Graeme Smith hit his maiden century for the club against Gloucestershire to guide them to their first Championship win of the season. The former South Africa captain made 103, including 16 fours, before being caught behind off Matt Taylor. Set 267 to win, Smith's exit sparked a Surrey wobble from 145-0 to 172-3. But Steven Davies, who gave up wicketkeeping duties for the game to focus on his batting, made 61 as they reached 267-6 to win by four wickets. Victory for either side was possible at the start of play, but Gloucestershire needed to get rid of Smith before he could bring the experience gained in 117 Test matches to bear on the situation. Having only won one Championship game since the start of last season, the home side needed a solid start to calm any nerves and Rory Burns was content to drop anchor while Smith imposed himself on the Gloucestershire attack. The left-hander reached his hundred off 107 balls, but surprisingly departed soon after when he under-edged an attempted pull through to Cameron Herring. Dominic Sibley only managed four before becoming Taylor's second victim and when Burns fell to Graeme McCarter for a painstaking 45 off 171 balls, Gloucestershire had renewed hope. Surrey's only other win since the start of the 2013 season came when they beat Derbyshire by four wickets last September. James Fuller trapped Gary Wilson lbw before tea, but Jason Roy (17) helped Davies add 59 and Surrey were only a boundary short of their target when both fell in successive overs to Benny Howell (2-66). With both gone, Surrey were pinned down for 13 deliveries before Zafar Ansari finally got them over the finishing line with two runs off Howell. "Gloucestershire simply did not bowl well enough at a world-class batsman at the top if his game. "They will rightly point out that they were a strike bowler down throughout after Ian Saxelby pulled up on the first day. "But when Smith went unexpectedly, they still did not really put enough pressure on - another couple of wickets and it would have been Surrey struggling. "Consistency is still Gloucestershire's biggest problem as they bowled extremely well at times in the first innings."